This before after is my very first attempt at a fabric chair makeover. OK, it’s not just a fabric chair, it’s a wing-back recliner! Oh my, what did I get myself into? To be honest, I had to face my doubts and fears before jumping into my first ( and not-so-beginners’ ) re-upholstery project. Totally worth it: we love the fresh new look of this makeover, and it was quite a fun learning process! 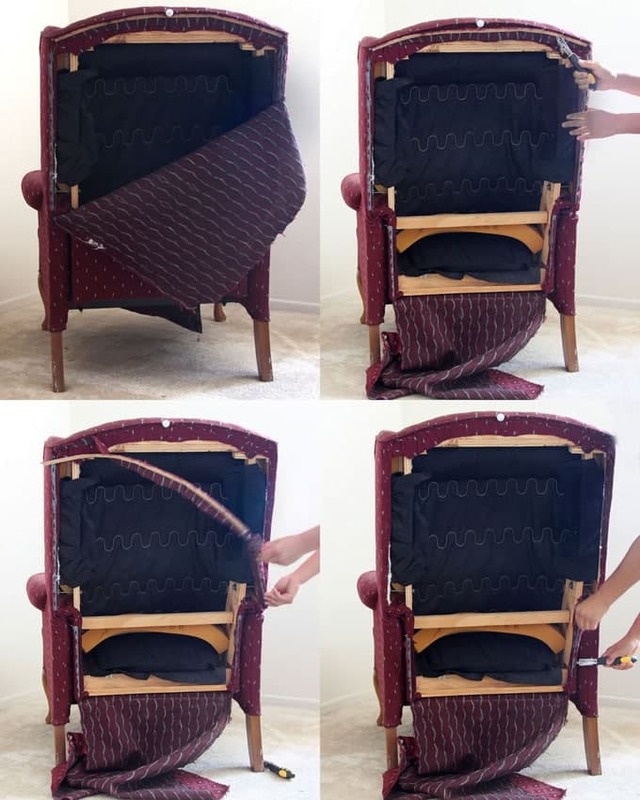 In this step by step tutorial , I will share with you an overview of everything I have learned about how to makeover an upholstered recliner chair, and lots of helpful tips for beginners . If I can do it, so can anyone! 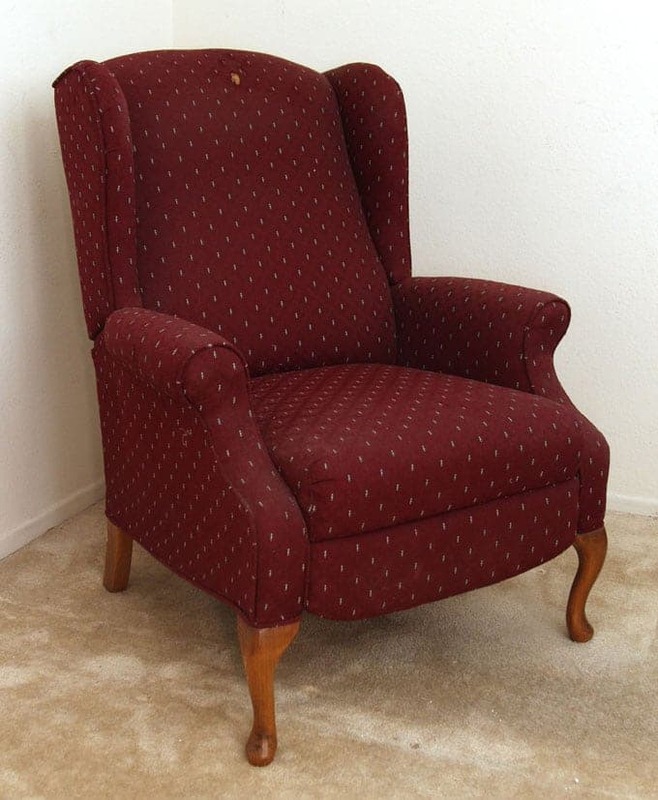 The beginnings: this wing-back recliner chair was a Craigslist find. Although it is a well-made chair, I never liked the fabric. So a decision has to be made: should we donate it, or transform it into a chair that spark joy every time we see it? 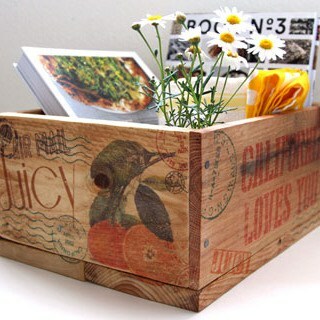 You know I can’t resist a potentially fun before after DIY project. When my dear mom happened to send me some beautiful floral home decor fabric, I took a deep breath, and dived in. Note: please check out a list of very helpful tips at the end before you start – tips such as : take photos of each step when you remove the fabrics, so you can reverse the steps when putting new fabrics on! IMPORTANT: follow basic safety rules when working with tools and sharp objects! Learn to use each tool properly. Use caution and work safely. Wear good quality working gloves and safety eye goggles when needed. The essential tools needed for removing old fabric: ( Some of the helpful resources are affiliate links. Full disclosure here. ) a flat screw driver to remove strip tacks, an upholstery staple remover , and safety eye goggles to protect yourself from potential flying staples! The back piece is held in place by cardboard strips and upholstery tack strips. Once we remove the back fabric, we get a clear view of how the other pieces are held together so we can begin to remove them. The upholstery staple remover is such a great little tool that makes the job so much easier. All the staples come up pretty easily with the help of this tool! Don’t strain yourself. Turn the recliner chair over when working on the bottom side. 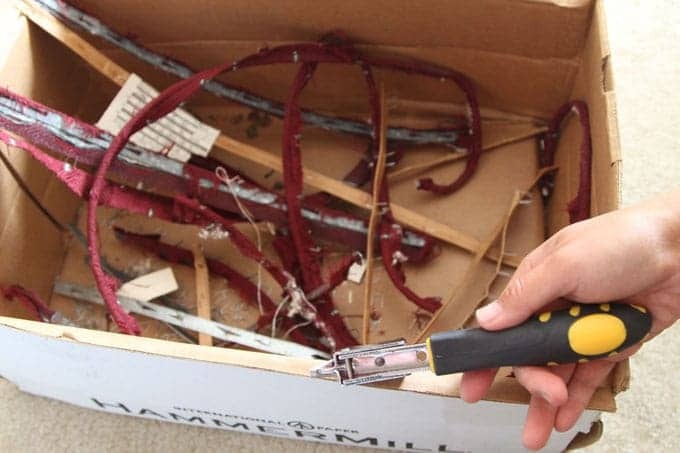 IMPORTANT: put all the loose staples and tack strips in a box so no one steps on these sharp debris! You can save the piping cords and cover them with new fabrics later. 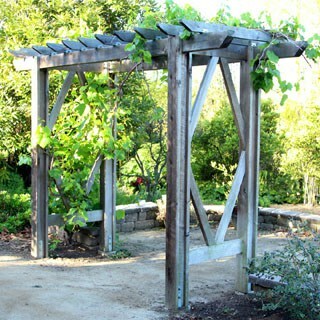 Related article: How we “remodeled” an outdoor patio using pallets, as renters! 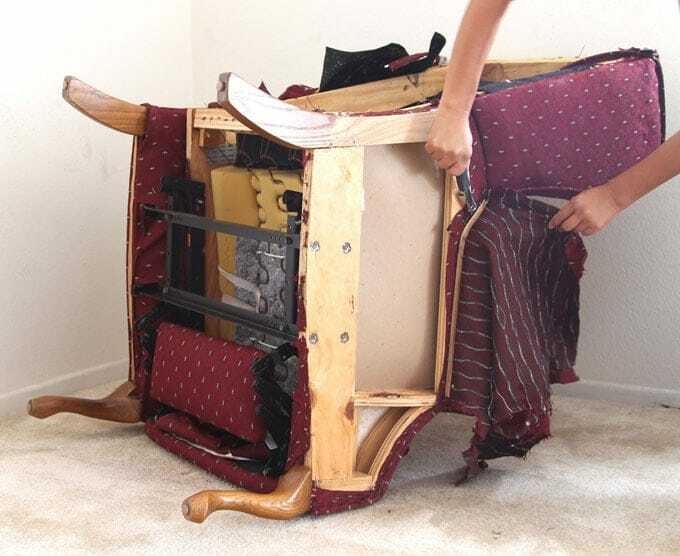 Pay close attention to how the side panel fabrics are attached to the recliner chair frame. Take LOTS of photos for later reference! I found this area to be the most challenging part of the whole project. 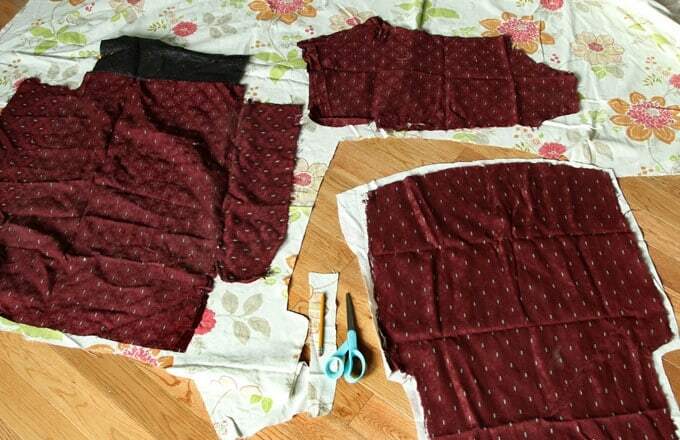 Tip: use the removed fabrics as patterns. Trace them onto your new fabric using a water erasable fabric marking pen or a pencil. Oh wow! I love the new look! Awesome job on this makeover! Wow! You did such an amazing job! I am in love with the after, it looks so professionally done. 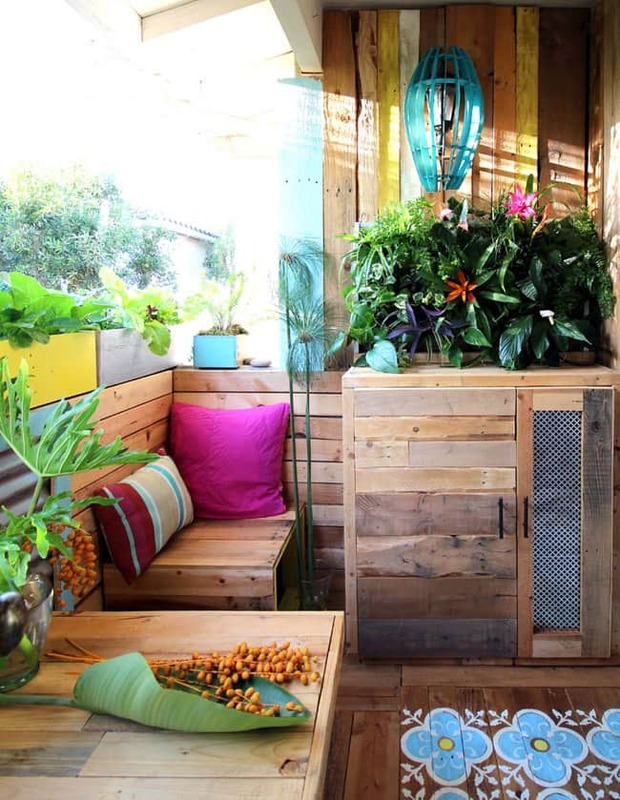 I’m also loving the palette patio DIY makeover!! Gosh, you did such a fantastic job! 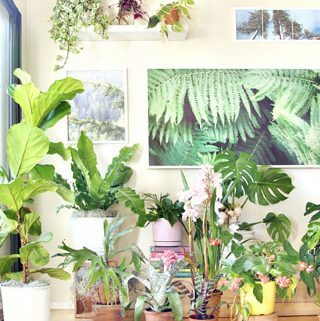 Looks fabulous! How gorgeous! You did an amazing job! i love it! What an amazing transformation! You did such a great job with that chair. I love the fabric you chose, it’s just beautiful! omg that looks so good! I wish I was such a DIY pro haha! Wow! I’ve always wanted to re-do a chair like that! Thanks for sharing the steps! Ananda – you never cease to amaze me!!! ?? Mercy me! You have a LOT of talent and patience for doing such a detailed project…and doing it so well! Beautiful transformation. hi phyllis, thank you so much! this rule has been one of our best decisions! hugs!! Very pretty re-do. You mentioned the cotton fabric covering you found under the upholstery fabric. The purpose of this is to protect foam and padding from the “sandpapering” effect of the heavier outer fabric. No special fabric has to be purchased. A twin 200 thread count sheet will work well. One trick I learned was to place some plastic under the cotton fabric covering the arms, seat and head area. This allows you to really clean these areas without worrying about soaking the batting or foam. No mold or mildew! I use a heavy garbage bag in my projects involving dining room chairs. Awesome! I think you have given me the courage to try this for myself! Thanks for sharing! omg that looks so good! I wish I was such a DIY pro ! Inspired! I have my Grand Mothers favorite chair. It is in serious need of recovering. I have almost thrown it out a few times thinking I would never b able to recover it. Now I have an idea of how to proceed. Thanks, I really wanted to give it new life. Now maybe I have a good shot! Thanks for sharing your way of life. Beautiful project and wonderful instructions. We have a chair exactly like that (but not a recliner)…how much fabric did it take to cover?? hi melissa, my mom gave me a huge amount of this fabric, so i never measure the square footage! =P i would can use a bed sheet or big sheets of paper to help with a rough estimate. I have the exact chair and I would love to reupholster it. And I love rhe fabric you used! Where did you get it?? hi robyn! my mom got it for me several years ago from overseas, sorry can’t give you a source on it! 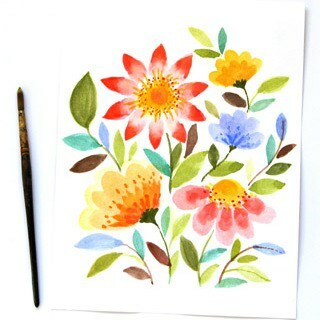 =) i would look up white floral home decor fabric on google!